In the Spring and early Summer of 2005, we constructed and ran two Roman wood-fired glass furnaces at our workshops in Quarley, Hampshire. The project, staffed by volunteers, ran for several weeks in an attempt to discover information about the working conditions of ancient glassmakers. The glass furnaces were based on information gleaned from the many excavations of Roman furnaces in recent years, using a quantity of original Roman bricks and tegulae (kindly supplied by archaeologists), and a clay daub. They were fuelled with wood, including beech and ash, and ran for 24 hours a day. Glass was blown by Mark (and by Bill Gudenrath for two days) during the daylight hours. 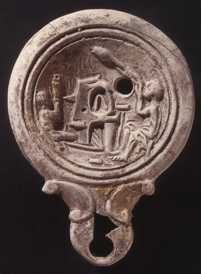 One of the very few depictions of a Roman glass furnace is found on a fired clay oil lamp of the 1st century AD from Asseria, Croatia (now in Spalato Museum, Croatia, inv.1094/30). Another lamp from Ferrara, Italy, has the same design (Museo Archeologico Nazionale, Ferrara, inv. 52196). A third lamp has been found at Spodnje Skofije, Koper, Slovenia, which has a less eroded and clearer depiction of the design found on the other two lamps. See our copy of this lamp on this page. The 2005 firing was thoroughly recorded, with attention being paid to aspects including furnace construction, fuel consumption, glass melting and working cycles, temperatures achieved, durability and efficiency of the furnace superstructure and working practices developed by the team. In order to preserve the glass vessels made, a wood-fired annealing oven was also built and operated. 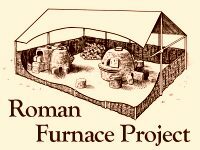 The tank furnace and annealing oven were partially dismantled at the end of the firing so as to record the remains for comparison with excavated remains of Roman furnaces. They were left exposed to the elements for nine months to observe the weathering processes before final dismantling. No experimental archaeological Roman glass project involving a furnace and workshop has ever been conducted in Britain over such an extended period, and we hope that the published results will prove useful to glass technicians, historians and archaeologists alike. See this page for the photographs of the Tank Furnace and Annealing Oven Demolition. This began the 2006 phase. Following the results of the 2005 firing, we wanted to explore other annealing oven and furnace structures, keeping within the bounds of Roman designs. In 2006, we rebuilt the smaller furnace, and built a separate, independently-fired annealing oven. The project was again staffed by volunteers, and attracted much interest from glass historians and technologists, as well as proving popular with the public on the Project Workshops Open Days. It has given us the opportunity to collect more data on fuel use and temperatures achieved, as well as to test another daub mix. Glassworking again played a major part in the experiment, with specific categories of glass vessels and objects being made. This year, we managed to attract one or two guest glassblowers, including, once again, Bill Gudenrath from The Corning Museum Of Glass, who worked on blowing Venetian glass during his stay. After the firing, the furnaces were covered and left for over a year. They were visited by several groups of people and interested individuals. The covers were finally removed in the winter of 2007, and the furnaces and lehr were fully exposed to the elements. We will monitor their deterioration and gradual collapse in the years to come! Click here for the Taylor and Hill article. Click here for the Sarah Paynter article.